Wild Boar Wood Campsite is a campsite close to London. The off-grid woodland campsite is located in Sussex, just 30 miles south of south London, with easy access via the M23 by car (roughly an hour-and-a-half’s drive) or by train to Haywards Heath railway station, which is just five miles from our site. The short distance and reasonable travelling time mean that we are a popular stop for people who are coming from London for a night or weekend away. Wild Boar Wood Campsite offers ecological camping in a beautiful woodland setting, in bell tents, each with an open fire for campfire cooking. 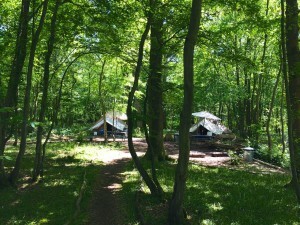 It is a real escape from the hustle and bustle of London and despite the relative proximity of the campsite to the city, you will really feel that you are getting away from it all and reconnecting with the natural world. 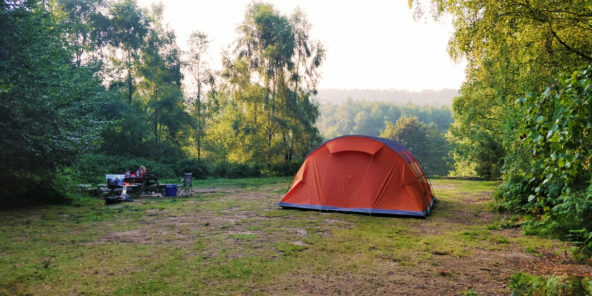 The campsite is located in a designated Area of Outstanding Natural Beauty in the Sussex High Weald, is close to the Ashdown Forest and lies between the Sussex villages of Horsted Keynes and Lindfield. In the local area, you will find plenty to do if you decide to leave our little woodland idyll. The steam trains of The Bluebell Railway run right past the campsite and you can hop aboard at Horsted Keynes or Sheffield Park, there are plenty of country pubs in the near vicinity, lovely walks, historic sites and beautiful gardens to explore. Take a look at our list of things to do in the area for more inspiration. 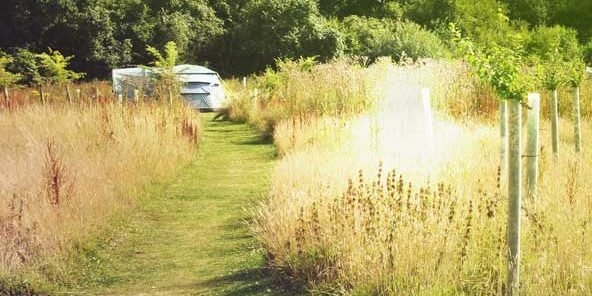 Our second campsite close to London, Beech Estate Woodland Campsite is also within easy reach of London. It is under 60 miles from south London, and also takes around an hour and a half to drive from the capital to the private woodland where our campsite is situated. At Beech Estate we have bell tents for the same wild glamping experience as is provided at Wild Boar Wood as well as forest pitches where you can pitch your own tent. The woodland here is 600 acres so there is plenty of space for woodland exploration and activities. We also welcome hammock campers and bivouac campers to the site.